Calling all jazz music fans! JazzBoston’s Jazz Week returns to Beantown on April 22, 2016 and runs through May 1, 2016. The Friends of the Hyde Park Branch Library and Artists-At-Large, Inc., are pleased to collaborate again for our fourth Jazz Week by bringing The Trombone Giants to the branch library on Saturday April 30, 2016, at 2:00pm. Veteran Boston trombonist and band leader John Licata will kickoff the event with his presentation, What was When!! The 1970s Boston Jazz Scene, with jazz by the Giants following. The Trombone Giants comprise John Licata and Michael Wang on trombone, Ben Schwendenener on piano, Rich Appleman on bass, and Jean Marie Corrois on drums. Come on in to Hyde Park for some history, some live jazz, and our available selection of jazz CDs for sale! The Friends of the Hyde Park Branch Library is a 501(c)(3) non-profit organization supporting the Hyde Park Branch Library and the Hyde Park community. We thank our members and the community for supporting our book and media sales, and for giving generously to continue sponsoring free music events and other activities for all ages at the branch library. Artists-at-Large, also a non-profit, introduces, supports and encourages local artists in exhibiting and sharing their art in the community and beyond, as well as paying forward to others by donating a portion of their show proceeds to a charity of their choice. 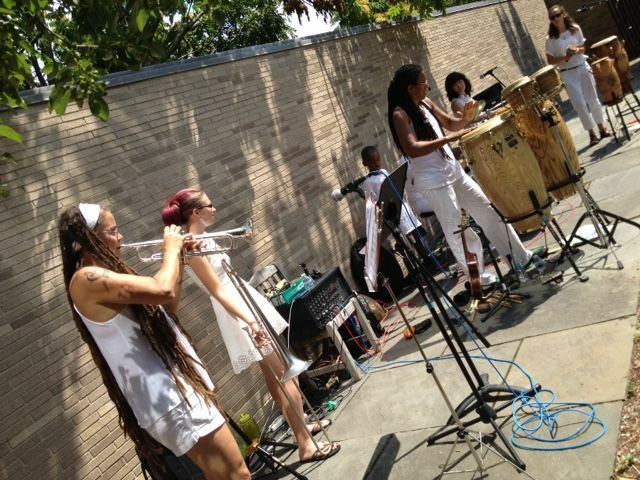 Saturday August 15th was sunny and hot, and the ladies of Zili Misik cranked up the heat with their world rhythms! Thank you, Ladies, for a wonderful performance! Thanks also to Tommey Seggers of Artists-at-Large for our photo pictured here. Earlier that day the Friends’ Children’s Books mini-sale finished its second day of sales, netting nearly $500 for upcoming programs at the Hyde Park library! Thank you, Book Lovers! The Friends’ Concert in the Garden Series has been playing every summer for 10 years, and we couldn’t let this milestone pass without notice! 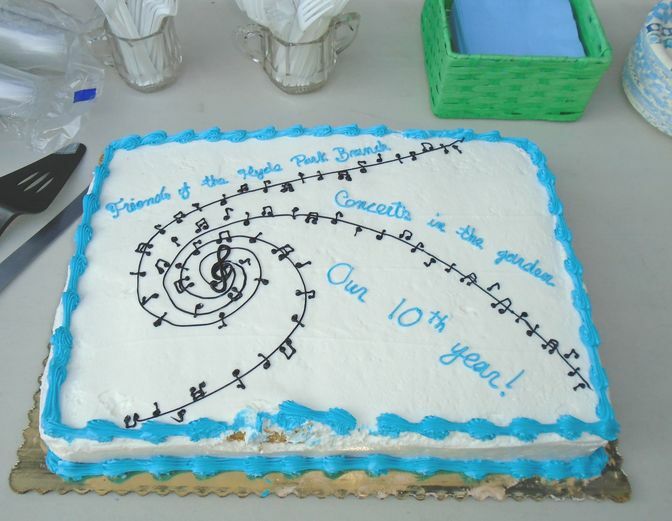 Just before the last show on August 20th, we cut and shared a celebratory cake with the audience. A big thank-you to the baker at Shaws in Hyde Park for your impromptu musical decoration! Hyde Park’s favorite crooner Tony Cibotti concluded our 2015 Concerts in the Garden series with another terrific show of Sinatra and company favorites. Annually, Tony generously donates his talents at every appearance at the library, and this year he brought back up! His wife and two ladies associated with the Pied Pipers provided some harmonious accompaniment. Thank you, All, for a great time! The Friends of the Hyde Park Branch Library are grateful for the grant by the Blue Hills Bank Charitable Foundation for this year’s concert series, and encourage our audience and Friends members to thank the Blue Hills Bank for its support of our library and community. Last week our family music concert with Wayne Potash, pictured here, had every kid in the audience jumping, singing and speeding around our garden like rockets! 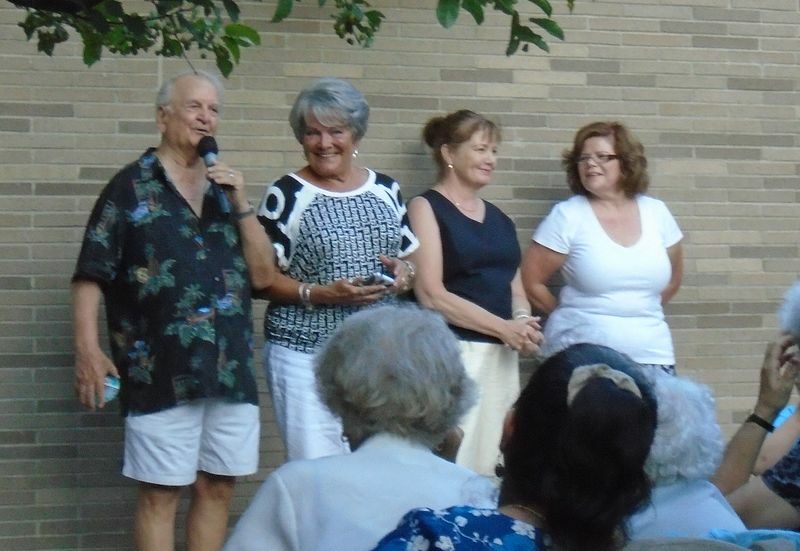 This week Thursday Aug 20th, join us a half-hour earlier at 6pm as we celebrate a successful 10th season with cake, followed by Hyde Park’s favorite crooner Tony Cibotti who will conclude our 2015 Concerts in the Garden series at 6:30pm. Concerts will be moved to air-conditioned Menino Hall in the event of excessive heat or rain. Tony’s performances of Sinatra and company are audience favorites, and he generously donates his talents each time he appears at the library. Thank you, Tony, for supporting the library and the community! The summer concert series is sponsored by the Friends of the Hyde Park Branch Library and supported by a grant from the Blue Hills Bank Charitable Foundation. The Patrice Monahan Jazz Trio, pictured here with a special guest tap dancer, played and tapped their way into our audience’s hearts last week! Please join us this Thursday, August 13, as Wayne Potash in the Friends’ next concert of the series, starting at 6:30p.m. Concerts will be moved to air-conditioned Menino Hall in the event of excessive heat or rain. A hard-working children’s performer, Wayne Potash performs for young audiences all over New England and is a a Parents’ Choice Award winner. 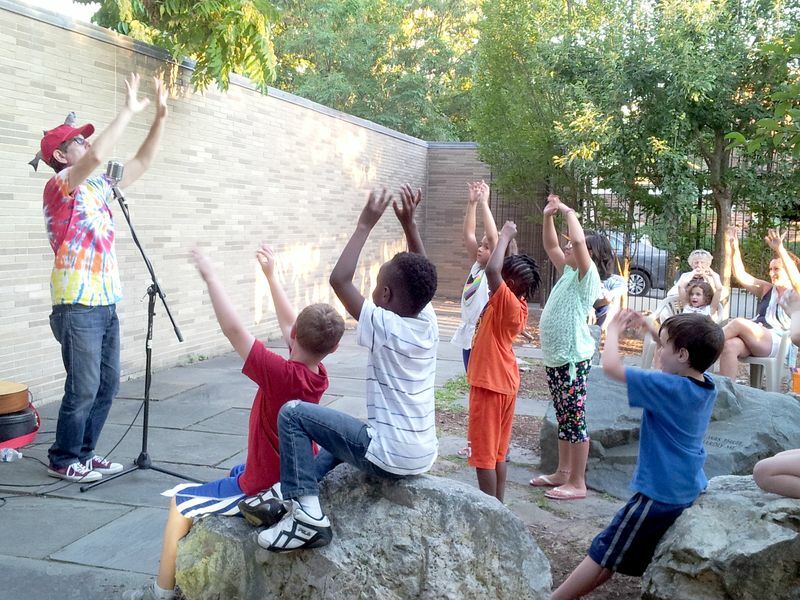 Sing-a-longs, dancing, jumping, and lots of fun are on the list for our Concert in the Garden this week! Our remaining concert will feature perennial Hyde Park favorite Tony Cibotti on August 20. Join us earlier on August 20 as we close of our 10th season with cake at 6pm! Tony’s performance will begin at 6:30pm! Zili Misik Returns to Hyde Park Saturday Aug 15! A special treat is coming to the garden of the Hyde Park Branch Library on Saturday, August 15, at 1:30 p.m. The seven women in the group Zili Misik will perform their New World Soul music. Zili Misik entertained an eager audience in Menino Hall on a blustery January day in 2013. Attendees at that concert have expressed delight about their return. Their program appeals to audience members of all ages, and includes a few numbers designed to involve the children present. Founded in 2000 by Kera Washington, Zili Misik’s sounds are rooted in the African continent while connecting Haitian misik rasin, Jamaican roots reggae, Afro-Brazilian samba, Afro-Cuban son, and African American spirituals, jazz, blues, and soul to create a sound all its own. Performers include drummers and percussionists, guitar, saxophone, and trombone players, as well as vocalists and artists on ethnic instruments. It will be a lively afternoon! This performance is sponsored by the Friends of the Hyde Park Branch Library who are most appreciative of a generous grant from the City-Wide Friends of the Boston Public Library making it possible. Laura DelGado Clemons and Bob Shea as D’Allegro Duo, pictured here, cooled down Menino Hall with their melodious tunes last week as the heat drove our series indoors! Please join us this Thursday, August 6, as Patrice Monahan Jazz performs straight-ahead jazz selections in the Friends’ next concert of the series, starting at 6:30p.m. Concerts will be moved to air-conditioned Menino Hall in the event of excessive heat or rain. 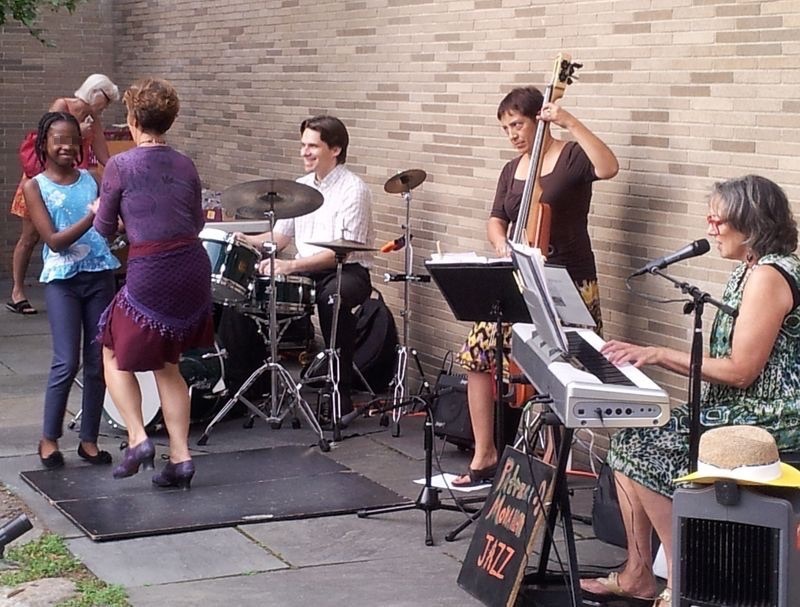 Patrice Monahan Jazz are a trio of talented ladies serving up rhythm and groove at every performance. Pianist Patrice Monahan leads with clear vocals, and rounding out the group are Berklee graduates Tal Shalom – Kobi on bass, and Miki Matsuki on drums. 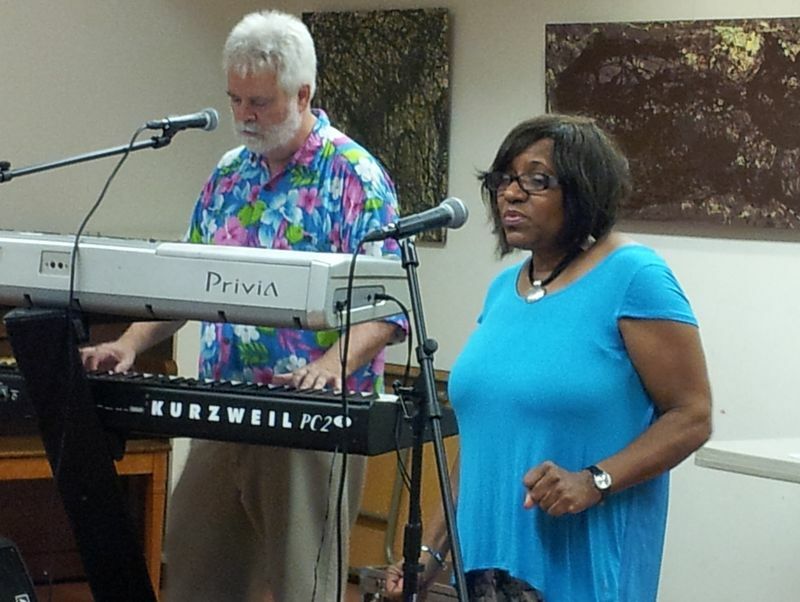 In addition to stage and event performances, they are jazz educators of children and adults. Our remaining concerts will feature family music and fun with Wayne Potash on August 13, and perennial Hyde Park favorite Tony Cibotti on August 20. Join us especially on August 20 as we celebrate the close of our 10th season with cake at 6pm, before Tony’s performance at 6:30pm! 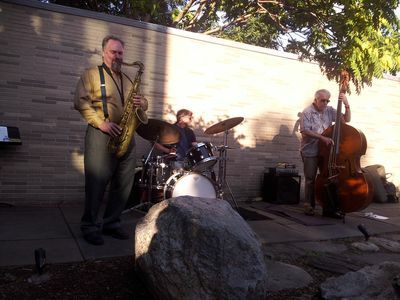 As the shadows lengthened in the Garden last week, the jazz by MJB Trio, pictured here, got cooler! Please join us this Thursday, July 30, as D’Allegro performs American Songbook selections in the Friends’ next concert of the series, starting at 6:30p.m. Concerts will be moved to air-conditioned Menino Hall in the event of excessive heat or rain. Laura DelGado Clemons, vocalist, Bob Shea, keyboard, and Andrew Shea, drums, comprise the trio. Laura and Bob have been performing together for more than 5 years, with Andrew joining them last year. They enjoy every opportunity to make music for others. D’Allegro specializes in jazz, rhythm and blues, and pop music. Garden concert audiences first heard D’Allegro in 2012 at the Friends’ Annual Meeting and the garden concert series, and we welcome their return this Thursday.